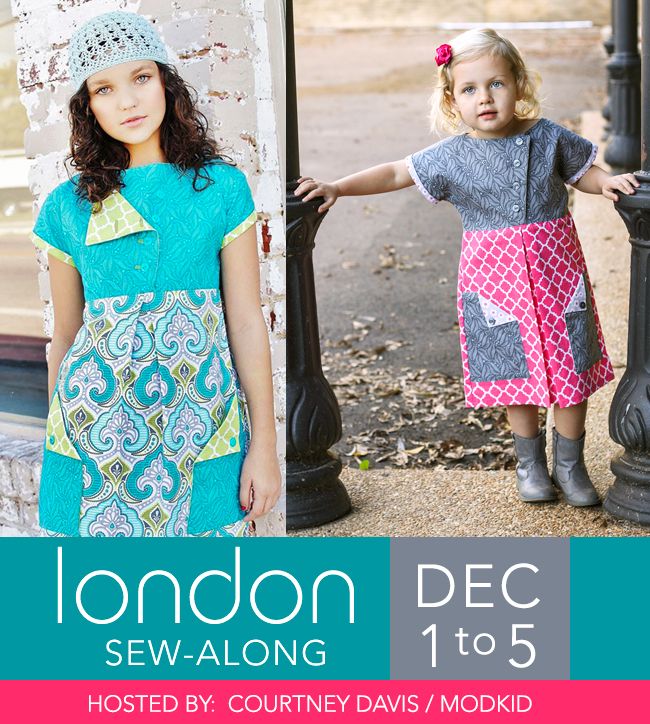 It is the final day of the London Dress Sew-Along!! We only have a few steps left to wrap things up, so let's get started. As usual, use a 1/2" seam allowance unless noted otherwise. With the skirt wrong side out, insert the bodice inside the skirt. Pin the bodice to the skirt right sides together all around aligning the side seams. Be sure that the front of the bodice is facing the front of the skirt (with pockets). Adjust the basted bodice overlap if needed to align seams. Stitch the bodice seam and finish with a serger or zigzag stitch. Press the seam allowance down and topstitch along the skirt edge. Hem the bottom of the dress by folding the bottom edge toward the wrong side 1/4" and again another 1/2". Press and stitch along the inner folded edge. Be sure not to sew the box pleats shut! Mark button locations on the right side of the bodice to align with the buttonholes. Sew four buttons on the right side of the front bodice. Pat yourself on the back for a job well done!! I have a feeling you've just made a little girl very happy! Be sure to add your photos to our Facebook group by Monday, December 8th to be entered to win the prizes. You can also share photos on Facebook and Instagram tagged #londonsewalong. We’ll announce the winner next week! Becky, not sure why it isn't working for you. When I clicked on it, it took me directly to the Event page on the FB group. You can search for MODKID Fan Group on Facebook and once you are in, just join the London SAL Event page on there. Thanks!